A San Francisco vlogger has posted video of himself escaping relatively unharmed after being hit by a car that has flagrantly run a red light. The rider's beloved Triumph Daytona 675, however, doesn't come out nearly as well. The vlogger reported that his customized bike was "destroyed in an instant." 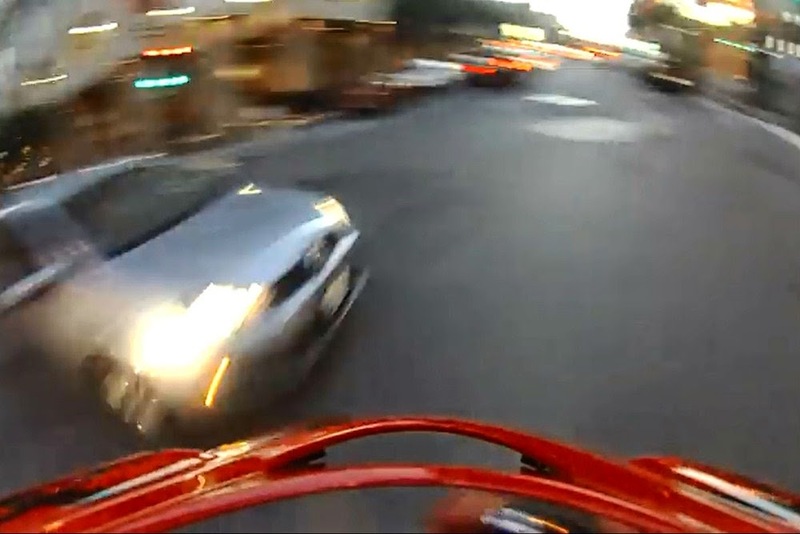 In the video, you can see the car speeding through an intersection more than 3 seconds after the light has turned green and the rider has set off at a reasonable speed. When the motorcycle and car collide, the rider flips through the air, over the car, and lands on his feet. The video clearly shows he is angry and shaken (who wouldn't be? ), but according to the vlogger he escaped the incident with "only bumps and bruises." Although the rider jokes about using "ninja skills" he also credits the quality of his gear for the fact things didn't turn out worse. "ATGATT saved me from severe injuries," he said.